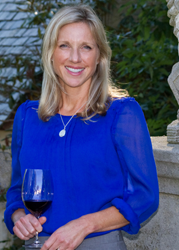 Cristina Mariani-May, Family Proprietor and co-CEO of Banfi Vintners will be a special guest at the 2016 South Walton Beaches Wine and Food Festival, where her family wines will be featured. “Come expand your world by connecting with some new people and exploring some great wines,” Mariani-May says. Wine superstar Cristina Mariani-May will join a dazzling roster of celebrity winemakers, chefs and entertainers, who will wine, dine and entertain as part of the four-day celebration of wine at the 2016 South Walton Beaches Wine & Food Festival. This year’s star-studded event will be held April 28-May 1, 2016 in Grand Boulevard at Sandestin located within the beach communities of idyllic South Walton in Northwest Florida. In 1919 the Mariani family acquired 7,000 virgin acres in Southern Tuscany around Montalcino, Tuscany. That was the inception of Castello Banfi. They experimented with a number of grapes, including some noble French grapes, but they focused on the zone’s native Sangiovese for Brunello. It is also the only winery in the world to receive triple ISO recognition certification for exceptional environmental, ethical and social responsibility, something this third generation winemaker is especially proud of. After earning her MBA at Columbia University, Mariani-May returned to the wine world and today, she is the family proprietor of Castello Banfi vineyard estate in Montalcino, Tuscany, and co-CEO of Banfi Vintners, a leading U.S. importer of fine wines with over 30 labels. Castello Banfi wines are currently sold in 85 countries. Of Italy’s 45 nationally approved clones for Sangiovese, six are from Castello Banfi. When not traveling to wine venues across Europe, Asia and North America to promote the wines of Castello Banfi, she divides her time between the Tuscan estate’s medieval castle and Banfi Vintner’s corporate headquarters in her native Long Island, New York. “I consider myself a gypsy and that’s the way I was raised,” she says. In April, the effervescent 45-year-old wine maven will travel with her family to the Northwest Florida Gulf Coast and appear at the South Walton Beaches Wine & Food Festival to talk about her family’s collection of wines and her passion for the world of wine. In addition to two days of tastings and seminars, wine lovers will be treated to live entertainment and special features such as Champagne Lane, featuring floating bubbles and dozens of Champagnes and sparkling wines. One of the weekend’s highlights is the annual Destin Charity Wine Auction to be held on Saturday afternoon, which invites auction attendees to bid on luxury travel packages, collectable wines and other fine living lots. Proceeds from the auction and festival go to support more than a dozen children’s charities in Northwest Florida. Mariani-May hopes wine lovers turn out for the festival ready for an adventure. “Come expand your world by connecting with some new people and exploring some great wines,” she says. Including Castello Banfi Brunello Di Montalcino 2010 which was named People’s Choice winner at the 2016 Tasting of Champions event produced by the Destin Charity Wine Action Foundation, the recipient of proceeds from South Walton Beaches Wine & Food Festival. The Craft Beer & Spirits Jam kicks off the festival Friday from 6 p.m. to 9 p.m.; the Grand Tastings are on Saturday and Sunday from 1 p.m. to 5 p.m. Advance tickets are $35 for Friday; $85 for Saturday and Sunday (tickets include Spirits Row, Champagne Lane, wine and food tastings, tasting seminars and live entertainment); and $175 for the VIP Tasting with express entry to the Grand Tasting. Two-day Grand Tasting passes are available for $150. The VIP Tasting is Saturday from 11 a.m. to 1 p.m. and the Grand Tasting starts at 1p.m. The event is rain or shine; sorry pets are not allowed in Culinary Village. To purchase tickets and view the full festival schedule visit http://www.sowalwine.com. This year’s annual South Walton Beaches Wine & Food Festival will be held April 28-May 1, 2016 throughout the Town Center of Grand Boulevard at Sandestin. The festival features a stunning showcase of the best wines the world has to offer. Celebrity wine producers and chefs present fine wine and food pairings from the world’s most famous appellations. The Savor South Walton Culinary Village offers a sumptuous array of foods to taste, wines to pair, as well as wine and food tasting seminars and live entertainment. The event is a major fundraiser for Destin Charity Wine Auction Foundation, which benefits children in need in Northwest Florida. For more information, including a list of attending winemakers and to purchase tickets, visit http://www.SoWalWine.com.